Adam Epstein makes his case to selectmen and community members. After a lengthy discussion Tuesday, Tisbury selectmen moved a step closer to approving a summer concert festival in Veteran’s Memorial Park. Selectmen voted to grant Adam Epstein, CEO of Innovation Arts and Entertainment, commercial use of the park on August 9 to 11, however, delayed granting him an entertainment license and a license to hold the festival on a Sunday. 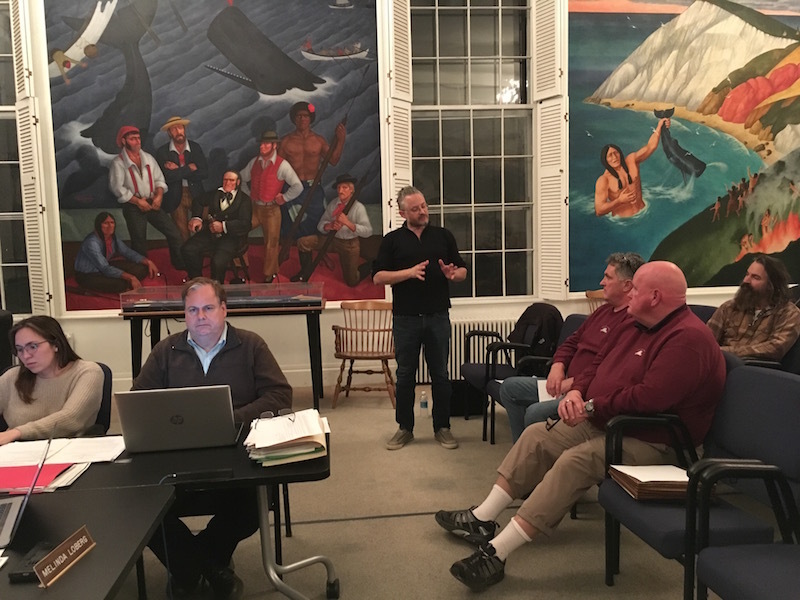 Selectmen opted to take more time to review the proposed agreement with the entertainment company and give the public a last opportunity to air their opinions. The proposed event is expected to appear on the agenda again for their Jan. 22 meeting. Selectboard chairman Tristan Israel said he wanted to take more time in part to make sure community concerns were taken seriously. Neighbors and abutters attended the meeting to voice concerns and approval for the festival. Dan Carbon, owner of Educomp, said he was worried about people using his business parking lot to watch the festival. But others said they thought the festival was a great opportunity, and emphasized Mr. Epstein’s experience producing the summer concert series on the Island. John Zannini, who owns Salt MV near the park, said he wholeheartedly supports the idea, and he believed attendees would be respectful of the area. Selectman Melinda Loberg said if the festival goes forward, the community will have the final say. “This is definitely a trial, and if it works we will go back to the community and say... should we do this again?” she said. Mr. Epstein, who has already said he will compensate the town and law enforcement for the event, said he was committed to working with the town to make the event a success. “We want to come back again, so we don’t want to ruin the opportunity by not handling it properly,” he said. In other business, selectmen approved a livery license for a new tour company for Breth Inc. a company owned by Bob Breth, who owns and operates Bobby B.’s restaurant on Main street. Selectmen also considered 2020 budgets from animal control, police, fire and ambulance services. The town’s new police chief Mark Saloio presented a preliminary budget of about $1,993,000 with an increase of 2.6 per cent. He outlined several items in need of an upgrade including security cameras, police firearms, uniforms, and professional development for higher ranking officers. EMS coordinator Tracey Jones presented a preliminary budget of about $737,000 with an increase of about nine per cent over the 2019 budget. Fire chief John Schilling presented a preliminary budget of about $367,000 with an increase of one per cent over this year’s budget. He also said there would be a warrant article at town meeting to transfer to hiring a full-time assistant chief for the department. Currently, the assistant chief position is part time and stipended. Selectmen plan to meet jointly with the finance committee to discuss the whole budget on Feb. 6. During the busiest week of the year we have a large concert causing staggering traffic jams blocking emergency vehicles, people trying to get to the ferry on time, etc. This will only enrich the promoters, not the Island. Have it in June or September and in a place that won’t block traffic. I reached out to the promoter about including under-recognized island musical talent as openers for his "known" performers, and have not received a call back. I see no indication this promoter intends to include island musicians in the lineup or, if so, he would include people beyond those who already get so many of the gigs. August is the WORST time for this event, especially in Vineyard Haven, which is already prone to being a traffic nightmare due to the Five Corners perpetual cluster. Businesses who believe this will be good for "them" might want to consider the bigger-picture impact. June or September make much more sense. Hi. I’m not sure who you contacted, but I’ve not received any messages about local bands. There are quite a few people in the MV music scene, and several we’ve already spoken with. Please do reach out though. Our contact info is available at MVConcertseries.com. I have said it before, the proof is in the details. I am sure there are solutions for many of the challenges this will face, ie: Where will MV Concert Series get ambulances to park at the venue that are not already overworked in the summer. Where will security come from and be trained for an event this large. This is not the PAC or Whaling Church! Maybe Tisbury will be at full capacity for a police force by then but we were severely short staffed last summer. The foot traffic to Tisbury businesses means people need to leave the venue and cross Beach Road and that for sure creates traffic problems. Where on island will you get the bathroom facilities for 6000 people, stage, fencing, food trucks? Place the food trucks on the grass or in the dust bowl pot hole parking lot? I don't believe we have this infrastructure lying around not used. Unless i am wrong this will all need to be trucked in from off island and that money never gets here for a boon to the locals. Is the plan to get it from the Ag Fair folks just a week earlier? Let's make it clear to the MV Museum. No events that weekend! Prime Marina boat owners, need to plan ahead to access their boats that weekend and maybe Prime will need to issue parking passes to their boat owners now so they can park. Will the Net Result, Roccos, Beach Road and the Film society need parking control that weekend? the Film Society already has an event for that Friday night on their calendar. Oops. It will be a feast for mosquitoes down there after sunset. Are we going to allow spraying? It could be fun if done correctly, but I will do what i know many of my friends do that time of year. We go to the quiet places on the island and wait for September and October to re emerge from the onslaught. Too bad we lost Musical Mondays because of parking and traffic issues. This is really just about the money after all or this never gets proposed. Wow! We've been to Martha's Vineyard in August,like Disneyland on Halloween.How is Willie gonna fit that gig into his already booked summer schedule? We wouldn't take that gig for many reasons and neither should the good people of Tisbury.What's the line-up for talent? Oak Bluffs handles substantially larger audiences for Fireworks and Illumination in the second smallest Town on the Island without professional promoters that are well received. It would be wonderful to have professional entertainers who may be of interest and appeal to our August visitors. Having had a long career in radio I am certain Earth, Wind and Fire and some similar brand name acts under consideration would be simply delicious. Right on. Wonder if there's any restrictions American Legion put on property when it turned it over to Town?Think there's conversion to parking lot wonder if there's more? Make entrance to the event contingent upon either using the VTA or parking at the High School and using the shuttle. The VTA already stamps passengers going to the AG Fair so they get a discount on admission. Do the same thing. No stamp , no admittance. Traffic issue solved. This is the Second busiest weekend of the year. You already have African American Film Festival which fill up the High School Parking lot. There are no spaces in Vineyard Haven. People Will take the spaces of local business The festival will immobolize the lokal Community. Presently, you cannot get through five corners on this weekend. How will you do it this August? The restaurants are full The hotels are full The Ferrys are full The homes on the Island are fully rented. Where are people going to go to the bathroom prior to and after the event. How are you going to move 8500 people in and out of the event!? You Will need a minimum of 200 school busses.... How are you going to control the hundreds of people who do not Buy tickets but listen on the periphery of event. How are emergency vehicles gettinhg in and out. How meny triage units will the promoter be required to have? Where are we getting the extra , police, fiiremen, mediical stafff? It Will take at least a week to set up If you want an event ....hove It on the shoulder season when local business can benefit. When there are rooms at hotels, houses to rent and space on the Ferry. If you choose to go through with this lidicrous idea please make sure alchol is NOT served. All Vineyard Haven needs is hundreds of drunkards running around town after the concert. I an not an alarmist.....i have run four outdoor Venues , deal with over fifty arenas a year and have produced outdoor events that have attracted over 50,000 people a day.I love Martha’s Vineyard and have been coming to the Island for over fifty years. No one will WIN on this event except the promoter and he may not WIN. Wouldn't it be wiser to have it this event somewhere that can logically contain the expected crowds? Could busing people to the High School and have the event there be a consideration? It seems to me that a Veterans Green venue and the proposed amount of attendees are not compatible. Like cramming clowns into a VW bug it could be done, but not so comfortable for anyone. One question: what if it rains that week? Unlikely in August, but not out of the question - and have the organizers of this event ever sloshed across that field after a good rain? It's no joke. The logistical items like rest room availablity and just how do you fit another 10 pounds in the five pound bag that already has 20 in it are very real. Having driven a cab during the season I see absolute need to examine just how does even just one emergency service vehicle have a prayer to navigate this barrage. Do it in September, this is just a nightmare waiting to happen. I offer my obligatory request for folks who need an alias to post have no credibility, none .